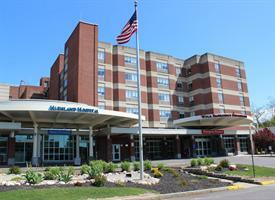 ROCHESTER, N.Y. -- Nearly all Highland Hospital patients will benefit from private rooms, through a modernization plan announced by the hospital. Providing patients with private rooms will further Highland Hospital’s ongoing efforts to improve patient care, help reduce the risk of infections, and offer more adequate, therapeutic space during recovery. The hospital is applying to the city of Rochester to rezone the facility as a planned development district (PDD) to allow the project to move forward. As it does with all development projects, the hospital will work collaboratively with residents of its surrounding neighborhoods throughout the project. Hospital officials discussed the modernization plan on Wednesday, July 25 with the Highland Park Neighborhood Association (HPNA). Additional meetings will be held with other neighborhood and business groups to gather input and to help address any potential concerns. The hospital also will continually update neighbors and area businesses on the project through meetings with the Highland Park Neighborhood Interaction Committee, its facilities blog, hospital website, and through regular columns in neighborhood newspapers. Becker noted that in addition to serving as an important health-care resource, Highland Hospital is a source for local jobs, and that the hospital’s success has contributed to the Highland Park and South Wedge neighborhoods’ revitalization and growth, as evidenced by the steady increase in property values over the last 10 years. Following rezoning and certificate of need approvals, the hospital expects to begin construction in spring 2020 and to complete the project in spring 2022.